A guide to stunning your interviewer with perfect answers to stumping questions In today's competitive job market, a stellar interview lends you an edge over the competition, which can make or break your chances at a new career. 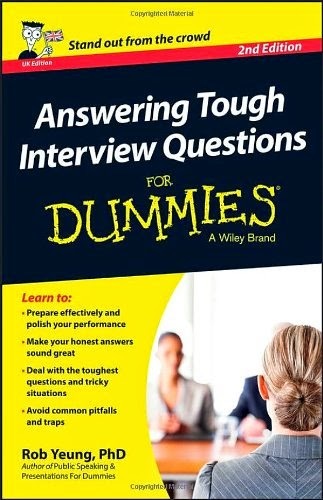 Answering Tough Interview Questions For Dummies, 2nd Edition teaches you how to perform professionally and productively under stressful interview conditions. With this handy guide, you'll learn to breeze through tricky questions and accentuate your most impressive qualities. This updated second edition features a ten-step guide to having a great interview, ten tips for projecting confidence, ten techniques for trouble-shooting your job search, 200 tough sample interview questions with detailed advice and model answers, proven strategies to combat nerves, and guidelines for perfecting your social media presence and handling questions that may arise from an online search. There is no need to enter an interview feeling unprepared with this guide by your side. Rob Yeung's holistic approach helps you make a positive first impression Shows you how to prepare to answer questions regarding your online presences (and how to avoid embarrassing search results) Provides essential preparation so that you can familiarize yourself with tricky questions before embarking on the stressful interviewing process Whether you're an entry-level worker or a mid-level professional, Answering Tough Interview Questions For Dummies prepares you to blow the competition away with your poised and professional responses.